A returning Art Bra artist, Nick is a 3rd-generation Austinite who has been so inspired by the artist Claude Monet that he and his wife gave their daughter, Amira, “Monet” as her middle name. Nick created this piece in memory of his mother-in-law, Solaie Sauter, who made him promised he would continue creating his art. Nick states that recent racial tensions in the news lead him to consider how breast cancer crosses all lines of race, gender and background. He created “Color Blind” by using metal grommets, metal washers and bold pink satin fabric, and with help from friend Marisa Ortiz from Novel Fashion, finished the ensemble with an accompanying clutch purse. It’s easy to see how this abstract artist enjoys bringing together canvas, metal & wood and creating abstract pieces with vibrant colors to evoke emotions. He hopes that “Color Blind” will remind viewers that breast cancer has taken away people of all backgrounds, and will serve as an inspiration to join forces in eradicating this disease. 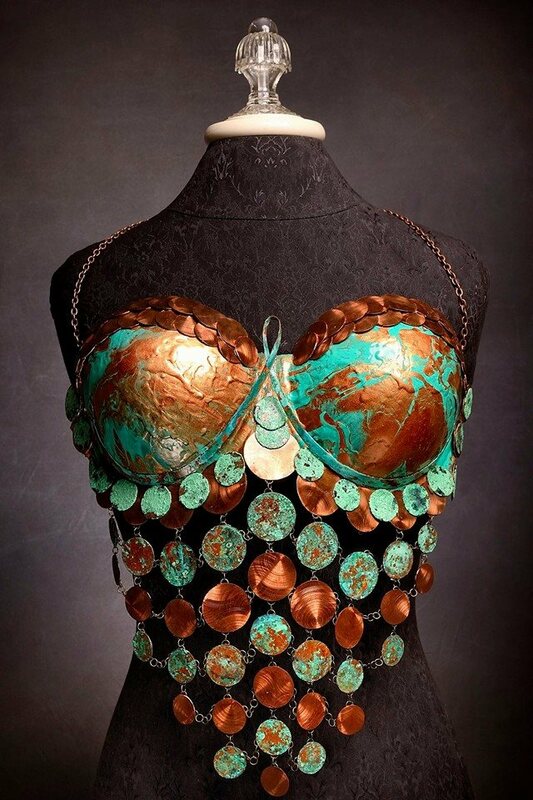 This talented artist also created “Achillia” for last year’s Art Bra event, a stunning piece that portrayed an elegant warrior’s armor. He drew inspiration from the Roman Gladiators who were forced to fight for their lives, just like women diagnosed with breast cancer. It featured hand cut copper medallions with a beautifully applied patina, and utilized a drill press technique that was popular with car enthusiasts in the 1940’s and 1950’s for customizing dashboards. “Achillia” was created to honor Jade Greenough and Irene Mattson, both breast cancer survivors.